Residence: Has no preferred place to stay but has small living quarters within the Dark Legion bases. Occupation: Dark Legionnaire and personal bodyguard / assistant to Dr. Finitevus. Likes: Tea (Favorite is Red Hibiscus) Figs, moonlight, Warm oases, Silver and Turquoise. Dislikes: Slackers, GUN, most humans, people getting in her way, Cold weather. Hobbies/Talents: Strangely enough she is a fairly good dancer, even if it's more of a tribal war kind of way. She is cold and quiet, Isis has a very apathetic or aloof demeanor. She can be blunt and has a deathly serious attitude. Due to her tribal upbringing she she believes in the natural low of "survival of the fittest" and won't hesitate to get rid of a person if they prove to be weak or foolish. She can also be slightly arrogant and quite ruthless at times. Isis is normally very patient, however she can have a temper if you get on her nerves. She does have a sort of code of honor, but typically has an outlook of "the ends justify the means". She is very quick on her feet and agile. Being a seasoned hunter she is able to sneak and move silently and is able to hide easily in the shadows. Due to her more tribal background Isis tends to be more in tune with her instincts, giving her a sharper sense of smell, hearing and sight than most thropes. She tends to do well in warmer climates, and can tolerate high climate temperatures. She has a robotic right arm that has enhanced strength, razor sharp claws, a small laser cannon fitted into the forearm, and an optical cloaking mechanism. Isis has learned most of the basic necessities of modern living from her stay with Finitevus (driving, operating phones / computers, etc) Granted she may not be as savvy as others, (Read: Don't ask her to drive the bus) she can still get around them with average skill. She was trained as a defender of her village to use a variety of different melee weapons and a sort of tribal martial arts. While she can use bladed weapons, she prefers using a wooden staff (or bo). Since she lost her arm at an early age, she is perfectly capable of fighting with only one arm should her robotic one become disabled. As the name implies, a section of Isis' body is encased in a shell of Chaos energy, forming a sort of armor that can act as an extension of her limbs. The energy itself is semi transparent and somewhat amorphous. It can extend outward from her limbs, increasing her reach by a few yards. 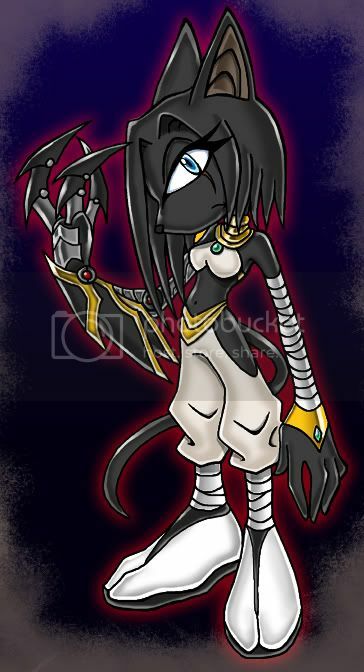 Commonly starts as only over one of her arms, however the more Chaos Emeralds Isis possesses the more armor she can form. Isis' greatest strength is also her greatest weakness. Disable her robotic arm and you pretty much cut her power in half. The Cloaking device she has isn't 100% fool-proof either, thermal sensors will still pick up on her and it's still possible for her to cast shadows while cloaked. Like all cyborgs, her cybernetic limb is vulnerable to EMP, hacking and magnetic restraints. She wears little actual armor, so what she can't block with her arm will probably hurt a lot. Aside from her laser cannon, Isis has no real long range attacks. Also because of her heightened senses, certain high frequency noise can cause her severe pain. Her apathetic nature tends to make her difficult to approach, thus she doesn't have much of a social life if any. This also makes her hard to blend in with the general public. While it takes a while for her to lose her temper, even if she's in a malcontent mood she can become stubborn, sometimes leading her to take unnecessary (and sometimes violent) risks. She was part of a small village that was mainly isolated from the outside world. She was one of the village's best defenders and had lost her right arm in an accident previously. The people were a very honorable and respectful society and after the wise cheiftian passed away his son took over leadership of the village. However the son had his own ideals, Cohorting with unlawful outsiders (mostly humans) as the village soon fell into corruption and disrepair. Disgusted by what happened Isis violently opposed the new tyrant but was overpowered by his numerous followers. Isis was accused of treason, exiled from the village and cast into the vast deserts surrounding it. After several days of wandering, Isis eventually collapsed where she was later found by Dr. Finitevus while he was doing reconnaissance. Seeing an excellent chance for experimentation, Dr.Finitevus took Isis and rehabilitated her, complete with cybernetic enhancements. Grateful for saving her life, Isis pledged her loyalty to Finitevus and joined the Dark Legion. After several effective successes in her missions, she was assigned to keep an eye on one of Dr. Finitevus' rogue Assistants, Dr. Talon. Dr. Finitevus Her employer and Leader of the Dark Legion. While she finds his somewhat eccentric tendencies annoying, she has a fair level of respect for him. She is surprisingly loyal to Finitevus in thanks for him saving her life. Name Relationship with that person. Anything that doesn't fit above.